New for the 2012 football season...it's a little feature we're calling the "Midweek Lowdown". Basically, we follow a lot of sites and read a lot of stuff. So this is going to be where we'll share that stuff with you. Simple enough? This is great news for many reasons. The longer Hoke's "undecided", the better Fitz chances of playing in week 1. Personally, I think he's just playing his cards close to the vest. Alabama doesn't need to know who the starter will be. VT AD Jim Weaver needs someone to play in 2018-19 and/or 2020-21. He wants someone he knows from a conference he respects...whatever that means. I can give you the Michigan blogger perspective, and that is I'm totally cool with this. 2018 seems like a long ways away, but in terms of scheduling future opponents, that's where we are, at least in terms of marquee matchups. 2020 is when Michigan and Notre Dame are set to resume their series after two years apart – at least that's the plan. Yes, an adorable 5-year old was forced to turn his Michigan t-shirt inside out...at kindergarten...in Oklahoma. In 2005, the school district enacted this dress code to "rid schools of gangs and gang related apparel". 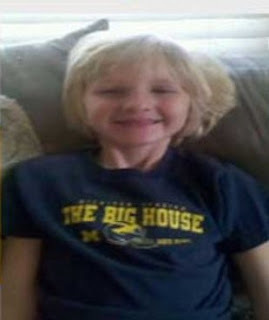 I'd be highly suspect of a 5-year old in a Michigan tee as well. The school district says it will revisit the dress code policy. The Wolverines are preparing for season-opener against defending national champion Alabama at Cowboys Stadium in Arlington, Texas. Ford Field, like Cowboys Stadium, is domed. "We're going to go down there and change up the environment a little bit," Michigan coach Brady Hoke said Tuesday night after practice. "I think it's good for us and have some distractions that are built in when you do that. We've been doing some crowd noise. I think AC/DC was on today when we did some first-down stuff." The Wolverines will not scrimmage at Ford Field. "(We will) practice with some situational, two minute (drills), put the high-pressure stuff on them," Hoke said. "See if they can stay focused." That's it. The Big House needs a retractable roof. Get PNC to pay for it. I can't think of anything more appropriate than the Detroit Lions finally turning into a decent team a mere three decades after the team's hometown has been economically buried and left for dead by the rest of America. The only people who can afford decent Lions tickets are six mildly competent car executives living in Grosse Pointe, and five of them are from Italy. Oh Deadspin, leading off with a quip about Detroit's economy is sooo expected. And of course, the snark doesn't end there. well its... nice colors,this shirts have held up quite well. its so comfortable and soft fabric material.great stuff..